There are numerous examples of great masters who were undervalued in their day, and even those appreciated by their contemporaries gained greater stature when re-assessed with hindsight. In the second half of the 16th century, a time when art was in a state of turmoil as Mannerism gave way to the Baroque, three outstanding painters with very distinctive styles ventured beyond the tastes of their age to experiment with new techniques, shapes, colours, and lighting effects that would only be fully appreciated much later. Today, they are held in much higher esteem than they were during their lifetimes. Jacopo Robusti, known as Tintoretto (1518-94), spent almost all his life in his native city of Venice. He worked in Titian's workshop for a short time, but had no particularly influential teachers. He was inspired by Michelangelo's grand manner and by Jacopo Pontormo's handling of light, and his work shows a typically Venetian sense of space and colour. His rapid, sweeping brushstrokes and the speed at which he worked can be seen in the great cycle of sacred paintings in the Scuola Grande di San Rocco (begun 1564), in those in the Doges' Palace, and in his large paintings in the church of the Madonna dell'Orto and the Scuola Grande di San Marco. Each of his versions of The Last Supper is unique, while his dazzlingly accomplished battle scenes, his remarkable portraits with their striking immediacy, and the beautiful women in his Susanna and the Elders (c. 1556) and Christ and the Woman Taken in Adultery (1545-48) illustrate his amazing versatility. In order to increase the dramatic impact of his paintings and to capture the complex poses of his figures, Tintoretto prearranged his compositions using small wax models on a stage and experimented with lamps to achieve striking chiaroscuro contrasts. Paolo Caliari, known as Veronese (1528-88), was a native of Verona but moved to Venice at the age of 28. Having seen works by Giulio Romano in Mantua and studied paintings by Parmigianino, he had already developed his own distinctive brand of classicism; balanced and harmonious in composition, but with a lively, often festive, content and an ability to combine anecdotal incidents with a calm sense of dignity. His wall and ceiling frescos in the Palladian Villa Barbero at Maser, near Treviso, show views of the surrounding countryside and architecture populated by youthful aristocratic and divine figures. The licence he took with sacred subjects such as a scene commissioned for the refectory of the convent of Santi Giovanni e Paolo — Feast in the House of Levi (1573) — attracted censure from the Inquisition. He was asked to account for the presence of ''buffoons, drunkards, dwarfs...and similar vulgarities". This and his other large religious feast scenes painted during the 1560s, his Allegories of Love (c.1575) painted for Emperor Rudolph II. and his many historical and mythological paintings provide a fascinating panorama of one of the most dazzling social milieux of the age. In contrast to Tintoretto's religious intensity. Veronese excelled at depicting the theatrical splendour of Venice in its Golden Age. Domenicos Theotokopoulos, or El Greco (1541—1614), was born on the island of Crete, which was then a Venetian territory and home to a flourishing school of icon painters. He later moved to Venice and is thought to have been a pupil of Titian, although his work shows more of Tintoretto's influence; on a visit to Rome, he saw both Michelangelo's frescos and Raphael's paintings. He then moved to Spain in about 1575 and lived in Toledo until his death. Like Tintoretto, he tried out his ideas with model figures and a miniature stage before starting to paint. His dramas were those of a mystic religiosity tinged with suffering, which prefigure the Baroque, although his elongated shapes were more Byzantine than Mannerist. His tense scenes shot through with shafts of light are reminiscent of another solitary artist, Lelio Orsi (1511-87), while the energetic handling of his sitters anticipates Velazquez' portraits. 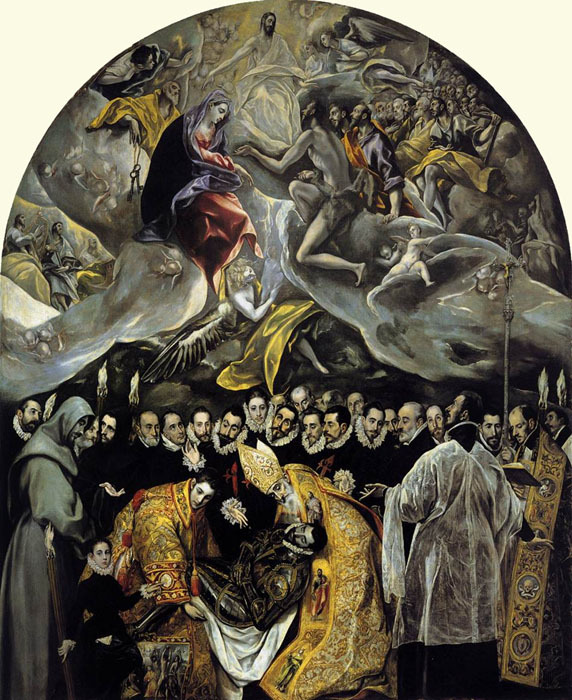 Such masterpieces as The Burial of Count Orgaz (1586), The Resurrection (1605-10), Adoration of the Shepherds (1612-14), and Pentecost (1600-10) illustrate his rejection of both classic and naturalistic styles. His chilling Portrait of a Cardinal was to inspire Francis Bacon and other modern artists. Rudolph II of Hapsburg (King of Bohemia 1575-1611. and emperor 1576—1612) gathered together a prodigious collection of paintings, sculptures, and objets d'art in Prague Castle and surrounded himself with artists from all over Europe. Goldsmiths, gemstone cutters such as Ottavio Miseroni, and painters, including Hans von Aachen (1552—1615), Bartholomaeus Spranger from Antwerp, Joseph Heintz of Basel, and Giuseppe Arcimboldo (1527-93) from Milan, nibbed shoulders with sculptors such as Adriaen de Vries from Holland, a pupil of Giambologna. The result was a tremendous flowering of culture at the court and the production of some of the most outstanding examples of international Mannerism. of both imperial portraiture and still life. Spranger worked first in Rome and then from 1575 in Vienna, at the court of Maximilian II. 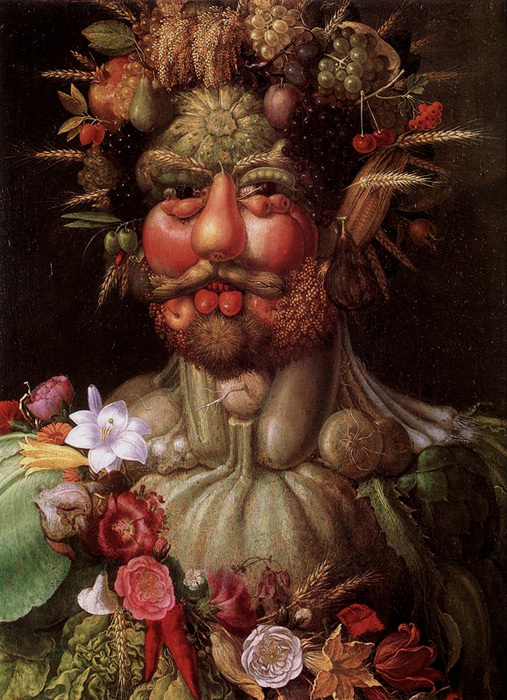 In 1580, he went to Prague, where he became court painter to Rudolph It in 1581.